I have just returned from a fun-packed visit to the Watts' Gallery at Compton. Every visit to the Watts' Gallery is fabulous but this one was rendered even more special by their current exhibition 'A Pre-Raphaelite Journey: The Art of Eleanor Fortescue-Brickdale', fresh from the Lady Lever Art Gallery at Port Sunlight (most lovely name for a lovely place). Those who have read the blog for a while will know I love EFB. 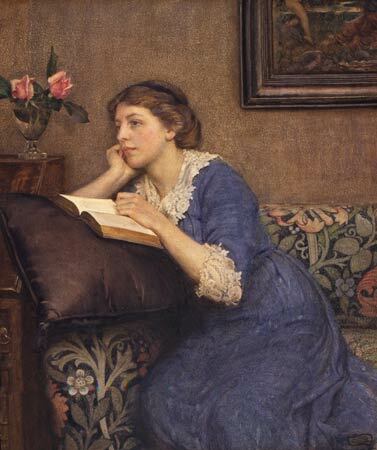 I am lucky enough to own an illustrated Tennyson which I talked about in these posts, and had possibly seen one or two of her works in real life, but on the whole had only experienced her pictures via books and the internet. Here is a chance to see a small but perfectly formed collection of her works in pen and ink, watercolour and oil. Who am I to refuse? 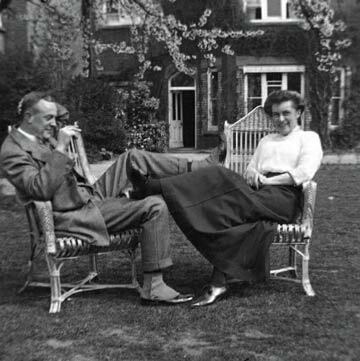 I am loving the shoes and spats on Byam Shaw, and look how relaxed the two friends are? Gorgeous. When Byam Shaw set up his School of Art at the time of this photo, Brickdale went to work for him as a tutor. 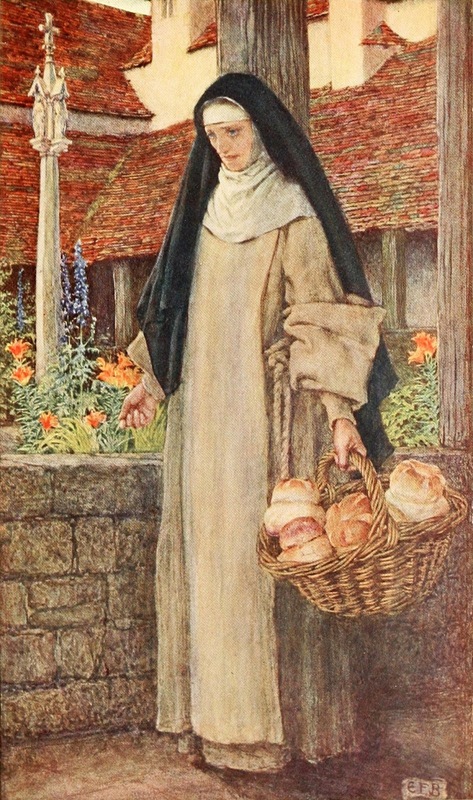 Anyhow, Brickdale was one of the most popular artists at the turn of the twentieth century. 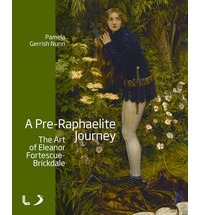 She was at the forefront of the last generation of 'Pre-Raphaelites' (together with her great friend, Byam Shaw), but since the popularity of Pre-Raphaelitism ceased in the 1920s, Brickdale has yet to feel the rediscovery that many earlier members of the movement have found. 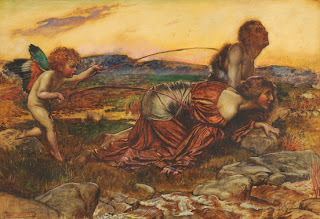 Her work was not included in the Tate exhibition (mind you, neither was Waterhouse, who has been re-embraced to our collective bosom with a retrospective at the Royal Academy). This exhibition marks an important refocus of attention on someone we used to consider a national treasure. So what is there to see? This image, taken from a Scottish ballad 'Burd Helen', must be one of Brickdale's most famous works, and it is breathtaking in real life as the clarity and lushness of the colour is astonishing. You can almost feel her hair between her fingers as she disguises herself as a page, her look of desperation as she hurries to change her appearance. This was one of the images I had never seen before, and I loved the redness of the knight's hair and the lilac of his tunic. 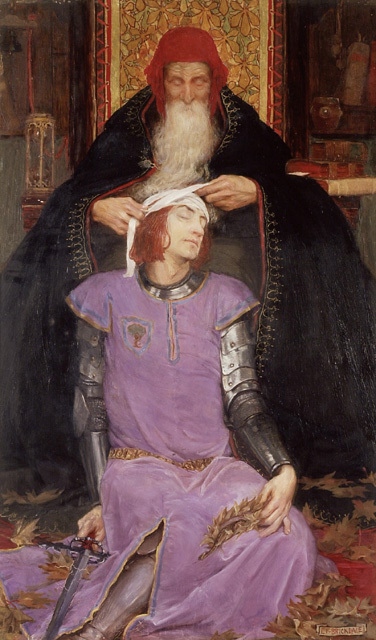 On the face of it, this is an image of a knight been treated for his wounds by a physician, possibly King Arthur and Merlin, but on another level it is about how time sorts everything out, healing all if we allow ourselves to be passive in its hands. Rather than Time being a force for aggressive change, or decay, Brickdale shows a familiar figure of Father Time looking after us, tending to us, soothing us. Brickdale's illustrations are on display here, in both black and white and colour. I have to admit I prefer her black and white work because the impact of the pen and ink is unbelievable, such denseness of pattern. I hadn't realised the diversity of work she had provided illustration for. 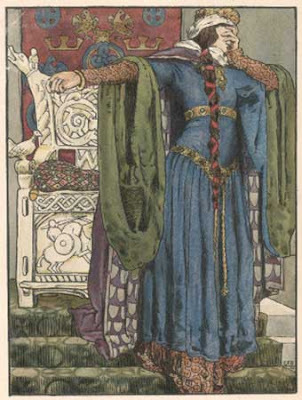 Shakespeare, Browning, other more obscure Victorian/Edwardian poets all have her beautiful line-drawing and gently-coloured pictures. Descending the stairs to the lower gallery (oh, mysterious), you are greeted by this gorgeous vision. The Renaissance style of this 'Little Head', flattened against a richly patterned wall, also recalls the female figures by Rossetti half a century before. 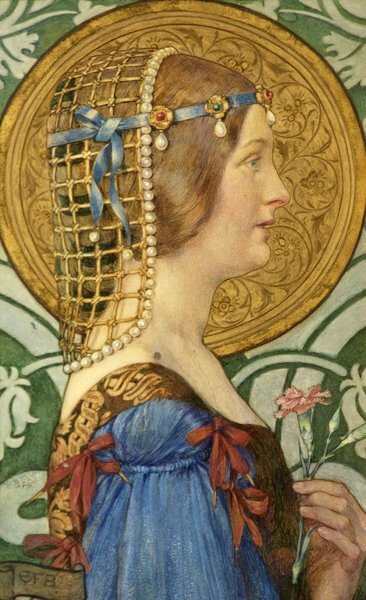 Again, the illustration cannot do justice to this golden gem, glinty and delicious, but the lady is a little treasure, very precious. Just as an aside, I was familiar with Guinevere, but when I saw it in the flesh this morning, I was struck by how beautiful the loaves of bread were. They looked delicious and I blame them for the giant slice of cake I had to eat afterwards. Well, this is jolly. It's inspired by Robert Browning's poem 'Another Way of Love' and is a blast of golden roses on top of a presumably dead cupid. Or possibly he's sleeping, let's go with that. 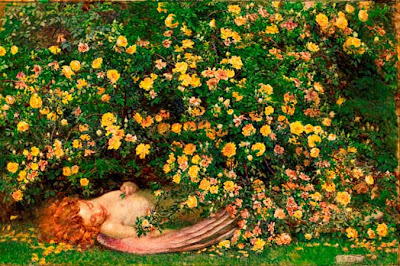 The green and yellow are so strong and buried beneath is the little rosy angel being showered by petals. The meaning of the poem suggests that the glory of June has no particular interest in our admiration of it, that it exists in its own little world. In Brickdale's picture, June is dead, possibly referring to the drop of the petals, but also referring to the 'serene deadness' of the cupid. The riot of colour jars with the title, the meaning as hidden as the cupid beneath the petal shower. Happy Valentine's Day Everyone! Such a romantic image, and nothing says I love you like a painting showing you both shackled like shire horses. Unless you like that. I'm drawing a veil. Possibly the most amazing picture in the exhibition is the above: a huge, crystal clear oil painting of Leonardo da Vinci showing his patron, the Duke of Milan, his wacky new idea for a flying machine. Moving across the scene, each little group is perfect, from the page holding the little monkey, the pair of women (actually based on portraits Leonardo and his assistants made of them), Leonardo and the little boy gazing up to him, and the Duke and his group of flouncy dandies in ill-judged tights. Really, the blonde bloke is giving it a lot of attitude for a man with a leg like an elongated mint humbug. The exhibition is brief but beautiful, a representative selection of her work, combining familiar with new gems, the chance to see paintings that you can only appreciate in the flesh and the chance to rediscover a female artist of some exceptional caliber The catalogue by Pamela Gerrish Nunn is reasonably priced and marvellously illustrated. Let's hope that Brickdale can become a regular part of the story so we can see more of her in future exhibitions. The exhibition runs until the 9th June and further information can be found here. 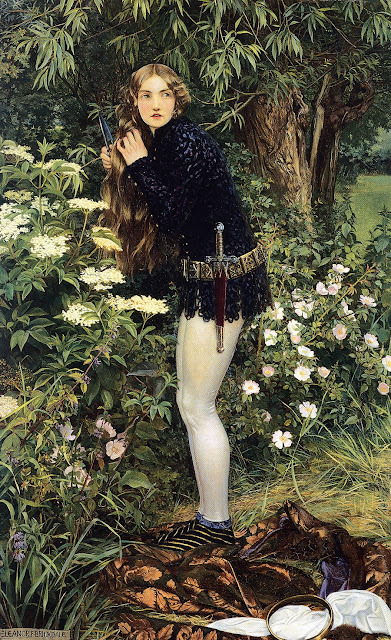 Oh, and please can we have a Byam Shaw exhibition soon please? His work is delicious. Lovely post,the Watts gallery is wonderful and I love these illustrations.Like the leg affection in th photo!